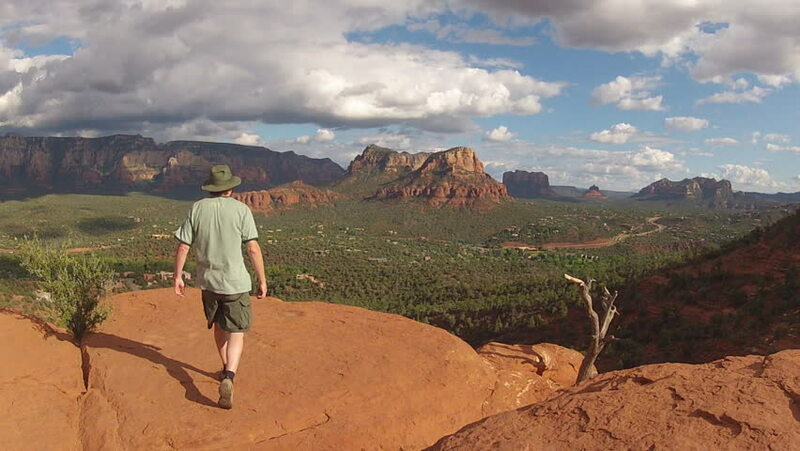 Wide shot of a man as he walks to the edge of a bluff and admires the view of Sedona Arizona. Explorer takes a moment to reflect and enjoy scenic vista. hd00:17Young attractive man enjoying the view from famous D81 coastal road with view of Golfe de Girolata from Bocca Di Palmarella, Corsica, France, Europe. hd00:26Hiker Taking A Photograph Overlooking Pretty Valley. A shot of a tourist hiker taking a photo on his smartphone of a undisturbed Welsh valley. hd00:30Hiker Taking A Photograph Overlooking Pretty Valley. A shot of a tourist hiker taking a photo on his smartphone of a undisturbed Welsh valley. 4k00:15Woman in an orange jacket, turquoise trousers and a knitted hat. Camera follows woman running up on top mountain, jumps on of rocks, raises arms into air, happy on life. hd00:16Low and wide angle shot of a man as he walks away from camera in a barren rocky desert. A hiker enjoys exploring a rough scenic landscape strewn about with small stones. hd00:22High angle shot of legs and feet of a man walking in a sandy desert. Handheld shot showing hiker and shoes kicking up sand as he shuffles and walks. 4k00:16KELSO, CA/USA - January 15, 2016: High angle overhead shot of the legs and feet of a hiker in a sandy desert. Point of view of sandy desert floor while walking. 4k00:13WHITTIER, CA/USA - December 14, 2015: Viewpoint shot of bicyclist on a truss bridge in Whittier California. An old rail road track has been converted into a bike path. hd00:15High angle close up shot of the feet of a man walking across dry cracked desert ground. A hiker walks step by step through arid environment on a dry sand terrain. hd00:22Close up shot of man riding a motorcycle on a very rough and bumpy road. Biker passes under a railroad bridge in the middle of nowhere. hd00:06LAUGHLIN, NV/USA: November 21, 2016- Close up of a man's hand inserting a ticket into a slot machine. A gambler tries his luck on a modern one arm bandit. hd00:30Shot of a man as he hikes away from the camera across a dry lake bed. A hiker sets out on an adventure across a wide open desert landscape.